No IFAK, Go Bag, or Range Bag is complete without a tourniquet. Whether you’re prepping for when SHTF, or simply looking to build a comprehensive first-aid kit for your home, you’ll need tourniquets. But knowing what type to get and which model isn’t as easy as it should be. That’s why we’re going to take a hard look at tourniquets! There seems to be a lot of myths regarding tourniquets out there, including the risks they involve, how they are used, and which the best ones. Today, we’re going to set the record straight and explain what you need to know about this handy, life-saving tool. It’s a common myth that tourniquets are unsafe to use. The truth is–no, not if they are applied correctly. A modern tourniquet is very safe to use. There seems to be a debate that goes back and force regarding nerve damage and tourniquets. However, if you are deploying a tourniquet nerve damage is one of the last things you need to worry about. Someone dying from blood loss likely won’t mind some nerve damage from a tourniquet if it means surviving. The Red Cross explains which types of bleeding you should worry about–and apply a tourniquet to. The only way a TQ is dangerous is if you attach it to the neck to stop the bleeding of a head wound. For obvious reasons, this will cause other significant complications, like asphyxiation. Tourniquets have been around for hundreds of years, and they’ve evolved considerably from early versions. While many people are familiar with the old belt-and-stick survivalist-type of tourniquet, the reality is that a professional-grade TQ just isn’t that hard to carry and can easily be on hand. Just because you can use a rag and a stick to stop the bleeding doesn’t mean you’ve got to. Now the trick is to find which tourniquet is the right one for you to carry. If anyone knows about using a TQ it’s the guys in tactical and emergency medicine–who all suggest two tourniquets and two tourniquets only: the CAT and the SOFTT. The features of a CAT tourniquet. Both tourniquets are similar in design, and both are in use by the United States military. They also are both designed to be used with one hand, which is critical when it comes to self-care. Let’s take a closer look at both designs, and discuss the pros and cons of each. By far one of the most popular tourniquet options out there, CAT stands for Combat Application Tourniquet. These TQs typically cost anywhere from 26 to 35 dollars, making them an affordable addition to your just-in-case supplies. 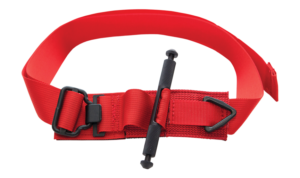 The CAT uses an adjustable strap that latches down and is secured by plenty of velcro, as well as a plastic windlass that is easily rotated to tighten the TQ to stop the bleeding. 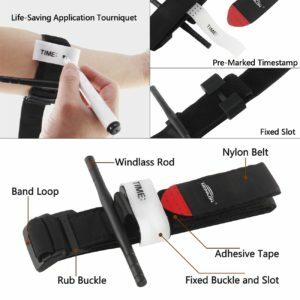 This type of tourniquet also features a red tip to make the end of the velcro strap easy to find and a white velcro strap that serves double duty to secure the windlass and provide a place to write the time down that the tourniquet was applied. Writing the application time directly onto the TQ allows hospitals to identify how long the tourniquet has been there and will help them prioritize treatment. The windlass locks into one of two hooks on the side of the TQ, which is then secured by that white strap. CAT tourniquets are compact, foldable, and easy to apply to yourself or another person with only one hand. For this reason, they’re incredibly popular with civilian first-aid kits, emergency medical staff, and the military. What’s your take on the CAT? If you’re looking for an alternative to the CAT, the SOFTT by Tactical Medical Solutions is a great one. It’s very similar to the CAT in the sense that it can be applied with one hand. Older SOFTT models had some issues, but the modern SOFTT Wide model has solved much of these and become standard. Unlike the CAT, the SOFTT uses a metal windlass that is heavily textured. A metal windlass is able to stand up to more abuse than a plastic windlass so it’s a great choice for durability. The heavily textured handle is also beneficial if you’re wearing gloves or are covered in blood. A great benefit to the SOFTT is a metal latch on the strap that makes it easier to open and place around a trapped arm or leg. The adjusting strap has a friction buckle to prevent the strap from loosening–which would obviously defeat the point of a TQ. The Red Cross trains with SOFTT tourniquets. The SOFTT also has a safety set screw that allows the user to lock the windlass down completely. This will prevent the TQ from becoming loose when moving the patient. The SOFTT is an excellent tourniquet and is gaining ground in the tactical medicine world. As with any popular product, there are knockoffs of the leading TQ brands which can look more appealing than they really are. Let’s face it–when your life is on the line, you don’t want to see your cheap TQ fail. There’s a reason to invest in getting the real thing. If you want tactical medicine effectiveness, you have to make sure you get the TQs tactical medics actually use! Unfortunately, the internet is full of fake or low-quality tourniquets, especially when it comes to the CAT’s design. If you’re checking out your favorite online mega-retailer for a TQ, be sure to check the prices. A $14 “CAT” tourniquet is a dead giveaway that you’re looking at a fake. Don’t forget to take a look at the manufacturer, as well. 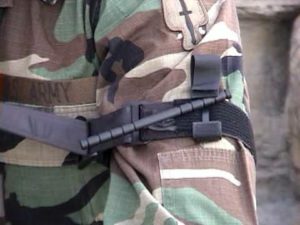 North American Rescue makes CAT tourniquets and Tactical Medical Solutions is the favorite maker of SOFTT tourniquets. Both types will cost more than $25 per tourniquet–which is well worth it in a life or death situation. Before you can save a life with your tourniquet, you have to learn to use it! Here’s a video from Mass General Hospital showing you just how to apply a tourniquet to a limb. While you can learn how to use a tourniquet from a video, nothing beats hands-on instruction. If you’re interested in learning how to apply tourniquets and perform other life-saving emergency first-aid, it’s well worth the investment to take a class. Check out the Red Cross training site to see what first-aid classes are offered in your area! Once you’ve learned how to apply a tourniquet, it’s important to continue to practice the technique. If a tourniquet is needed, you have a matter of seconds to act, so you need to keep your skills sharp. When it comes to saving lives, practice is key. While you can train with your emergency TQ, you might want to get one specifically for practice. Repeated use of your tourniquet can wear it out, and you want your tourniquet to be in great condition and ready to use when you need it. There are purpose-built training TQs, but you also can use a cheap knock off to practice. Just don’t forget to mark it in some way so you know at a glance which is which. Carrying a TQ as part of your EDC is pretty easy. Unlike a gun or even a knife, you don’t have to conceal it. It doesn’t matter if someone sees your TQ. You can shove one in your pocket, but a belt pouch is likely the better choice. There are many ways to carry a tourniquet–including a variety of different holder and pouch styles. Companies like Wilder tactical, HSGI, and North American Rescue all produce high-quality belt mounted TQ pouches, so you have lots of options. You also can stash one in your vehicle, backpack, or medical kit easily. Wherever you choose to carry your tourniquet, be sure you can access it very quickly. It doesn’t do you any good if you need to dig around just to find the thing–not to mention get it out, on the injured person, and secured. Here are a few different TQ carriers to keep your tourniquet accessible and ready to rock when you need it. A combination tourniquet holder and med kit, this option is a great way to securely carry your TQ and other necessary medical supplies–without getting in your way. A convenient, simple method to attach your tourniquet to a MOLLE system. It’s designed to work with CAT and SOFTT tourniquets and can be attached to the top of the Blue Force Gear IFAK kits. 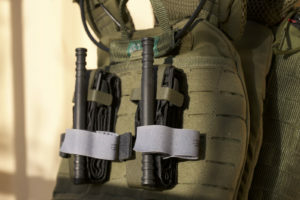 This system is available with a number of attachment options, including MOLLE, Tek-Lok, and Quick Clips, and works with both CAT and SOFTT tourniquets. Wilder Evolution Series Universal Tourniquet Pouch - Quick Clip 1.75"
Made by one of the leading CAT tourniquet manufacturers, this case is a durable holder for your CAT tourniquet. 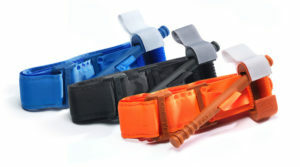 It easily attaches to a belt with the Blade-Tech Telkom Belt Attachment. Are tourniquets a must have? I think so. About 50% of combat deaths were due to blood loss in wars past, and I would hazard a guess that too many people in the civilian world have died due to a preventable hemorrhage. A TQ is a very cheap investment and for less than $50, you have a potentially life-saving tool. Of course, it’s useless if you don’t learn how to use it. Brushing up on your emergency first-aid knowledge with a class can be a little costly, but if it means you have the knowledge and practice to save your own life or the life of another, it’s well worth the price. What are your experiences with tourniquets? Do you feel like the RATs or the ratcheting tourniquets are good to go? If so let us know below. Don’t forget to check out our reviews of the best IFAK kits out there to keep building your emergency medical kit. Anyone have an opinion on Recon Medical tourniquets that are $15? They have a metal windlass and there are pretty good reviews on Amazon. One additional advantage of the SOF-T WIDE is that they can be strung together in series, if you have to TW a very large thigh, for example (like on an NHL player). +1 on Skip Kirkwood comment. I live in the South and quite a number of folks I am around at ranges run in the +size and stringing together capability became very important to me. I really like the RATS tourniquet. I think it’s way better than the CAT. You can put the RATs on with 1 hand and it can expand and/or contract with the body. The RATS tourniquet is not in the same class as the other two which are approved by the Co-TCCC. This has been argued to death on the interwebs. The RATS is in no way superior other than you can wear it like a belt and look like super-Timmy out in town.